Do you have one of these recipes pinned, just waiting for the perfect chilly fall evening, or maybe a night when your feeling a little adventurous? Well, wait no longer! This no fuss dinner idea deserves to be on display more often, and is much less complicated than you may be thinking. You know I love pumpkin, and anywhere I can wiggle some pumpkin into a recipe, then I’m gonna do it. However, this recipe puts pumpkin in it’s rightful place, on full display! So it’s been a rainy day, and I’ve been scrolling through Pinterest, and what do I come upon but the Pioneer Woman’s new fall line! Have you seen it? OMG! I’m totally in love with all of her products. Imagine my surprise when I realized that this pumpkin soup recipe was hers. Coincidence…of course, but I tried to spin it and tell the hubby that this was a sign that I should own every piece in her new fall line. Possibly as a Christmas present? I sure hope he picked up what I was putting down! I digress…anyway this recipe was a total winner, and you can find it here through Pinterest. I paired this pumpkin soup with grilled cheese using on a crusty roasted garlic loaf, (using whatever cheese I happen to have in the fridge, in this case it was mozzarella and Velveeta-don’t judge me). **Changes I made: The family and I went to the farm a picked up some pumpkins. I came home, cooked them, then pureed and bagged then up (I bag with 2 cups of puree at a time). From one large pumpkin I got about 15 cups of puree (this should hold me over for the next month or two-Ha!). Because I used my own, I used 4 cups of puree and 16 oz. of stock. I also, added a dash of cinnamon & allspice along with the nutmeg that was called for in the recipe. Basically, I used the recipe as a base, and after tasting I adjusted to my own taste buds. I truly hope you try this and love it as much as we do! Happy Fall! Sounds so good. I love pumpkin soup. Great call adding the extras. I love doing that and making something my own. Catrina, me and you! This pumpkin soup is awesome. I felt, for me, this recipe needed some more depth in flavor, the extra spices really bumped it up. It’s freezing here this morning and this looks the perfect recipe for lunch this afternoon! Thanks for the additional tips! Elizabeth, hearty soups and fall weather are perfect together. Give this one go, you’ll be happy! This sounds amazing!! Perfect soup for fall! I would love to try it now find somebody that knows how to make butternut squash soup thats the real deal!!! I just roasted pumpkins yesterday and will be making pumpkin soup tuesday for our ladies night. Get it Ladies! Hope the ya’ll have a great time. Since I discovered how easy it is, I roast all my pumpkins. It makes the recipe much more special, and everything feels much more homemade. I’m so glad you posted this! I’m very into soups lately and had forgotten all about my love for pumpkin soup. Thanks, glad I could remind you! Soups are perfect for this time of year, they’re warm and cozy, not to mention super quick. Pumpkin soup is my new love too! This sounds so yummy! I always make acorn squash soup in the fall but I’ve never made pumpkin soup. Ooh, acorn squash, yum! I’ll have to find a nice recipe for that soup. Try this one, it may surprise you! This looks delicious!! I love pumpkin recipes! I will have to try this one out for sure!! Amber, I thought the same thing when scrolling through Pinterest. It turned out great. YuM! I have been telling my husband I want to make some soup!! This is perfect! Yes, and this is a great one to start the season off with, so simple. Glad I’m putting my Pinterest recipes to good use. 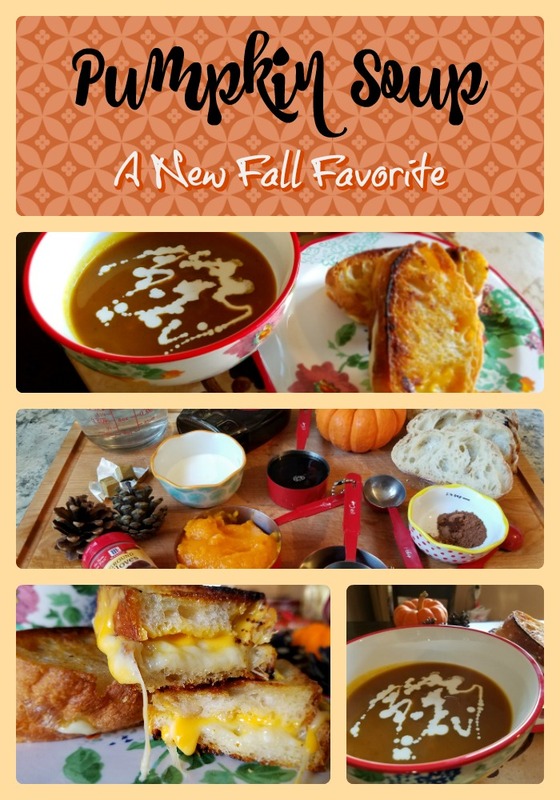 Those grilled cheese with the pumpkin soup look insanely good! What a perfect fall dinner for the family. Oh my goodness, Amber, not to toot my own horn, but TOOT (mostly because it’s too simple to mess up-haha)! They were fab! You’re right, great for fall. you had me at pumpkin! looks so good! Lyndsey, if you love pumpkin, you’re gonna love this! I don’t think I’ve ever had pumpkin soup, but I would give it a try. Looks pretty good. Brittiny, I was more than a bit skeptical when I first came across this recipe. Turns out, it’s delish, ya gotta try it! Yum! Pumpkin soup sounds amazing, and I need to check out her new fall line. Yes! This soup was a total surprise…and her fall line, so cute! Absolutely! Pumpkin soup and snuggles, sounds like a party to me! Me and You both, fall is my favorite! This sounds delicious! Soup or chowder with grilled cheese is one of my FAVORITE cold weather meals! And girl, that Pioneer Woman fall line is to die for. I already hinted towards my husband that I wouldn’t mind a few pieces of it under the tree. Ree is my spirit animal. I just made her stuffed shells the other day and they are amazing. HA! We need to be in the Ree fan club, or start a Ree recipe club!